Benefit from of a risk-free service in Broad Green that has gained over 95% of positive feedback! Q: What services does window cleaning Broad Green provide? 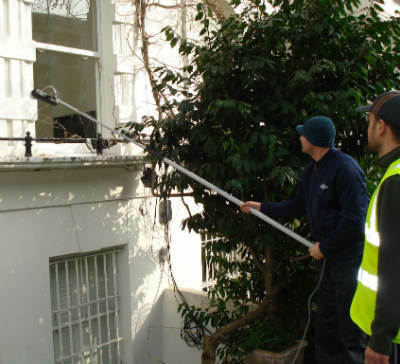 A: The professionals will carry out exterior window cleaning with the help of the latest water-fed pole equipment on the market. For buildings above the fourth floor, we'll dispatch seasoned climbers for rope access window cleaning. For interior pane polish, the team will use standard ladders and squeegees. A: A couple of of raindrops won't disrupt the Broad Green window cleaners' work – rainwater is usually deposit-free. However, if we face a cloudburst, then we will kindly ask you to hold off your booking for another day. A: As long as the specialists can pass through your front gate, they can blast away all grime without you having to be around. If your panes need a meticulous inside polish as well, then we'll perform a swift key pick-up and delivery service. A: Usually, the purified water storage inside the team's cleaning vehicle is always full. In case the tank is empty and with your approval, the specialists can effortlessly link the water-fed rod to any accessible water source. A: Once we tell you that the team's on their way, you'll need to make sure that they can enter your property unimpeded. In addition, the technicians will require a parking spot within 30 metres from your property and on the same side of the windows you want polished. A: If the team is nowhere to be seen because of serious traffic, we will tell you about the setback and contact you as soon as they arrive. With the proven water-fed pole cleaning tool, the experts can help you overshadow your competition at modest prices. And you can press down our window cleaning Broad Green rates even further by mixing two or more of our washing services together! To learn the exact numbers behind our price offers, make sure to stop by our neat price table below. With window cleaning in Broad Green, we can improve the appeal of your building even if it scrapes the clouds above. Let's look at what you'll get once you go for our custom-tailored service. For external window washing, the Broad Green window cleaners will deploy a extendible water-fed pole. A water pump inside the cleaners' van will pump purified water up the hose and out of a brush-head extension. The water, in conjunction with the brush-head, will undo any traces of mud from the windows of any four-storey building. With rope access window washing, the experts will use reliable climbing gear to reach even the uppermost floors in your commersial or home property. We own all needed COSHH documentation and risk assessment reports and can send them to you in a moment's notice. Moreover, we regularly check the cleaning gear to ensure that your appointment will go according to plan. And to dight every interior corner of your glass surfaces, the proven team will use the established sponge and ladder cleaning method. Do any of your friends need help with blasting away stubborn window stains? Continue reading to learn which areas the Broad Green window cleaners can cover. For those of you who'd rather book window cleaning services Broad Green CR0 online, fill in our get a free instant quote form.